A few years later, I built my first HF go kit: a QRP station centred around a Yaesu FT-817D and a Buddipole portable dipole antenna that would run off of solar and batteries. It was published in TCA and QST. 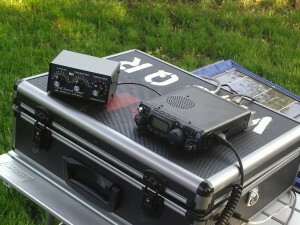 My local group of radio friends used this station to operate Field Day twice from remote locations. My current field station is a Yaesu FT-817 with the TX inhibit removed and the high-stability TCXO installed. The antennas are an Alpha DX Sr. 80m-10m portable vertical, and a homemade 2m/70cm J-Pole made out of twinlead. Along with the primary components, I carry a CW paddle, a Heil dual-element mic with base, a SignaLink for digital modes, 2 60W foldable solar panels and a little Nautilis portable power pack. The radio also has 2 internal batteries installed, and I can use either solar panel to charge one battery while operating from the other. 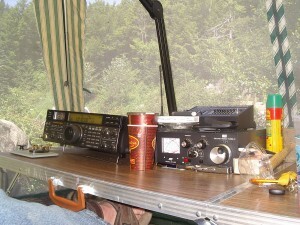 Most recently, I used this rig to operate Field Day 2015 from Victoria Park in Cobourg, Ontario as VA3QR 1B ONE. 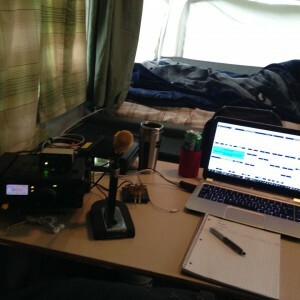 I suppose my love for portable operation is why I’m looking forward to participating in the St. Paul Island CY9 DXPedition next year. I’m also looking forward to future CFARS/MARS exercises that have a portable operations components.